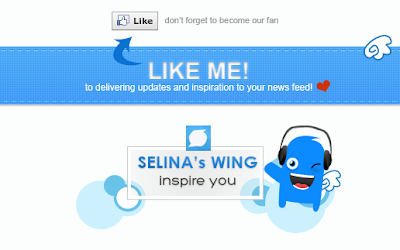 Join in Selina's Wing on Facebook! You won't catch my updates article from Selina's Wing when my blog always delivered it to your account Facebook when you login in on everytime! So Easy! Give more Freebies, Promotion and Giveaways to make you happy! If you are blogger, explore the Blogging Tips and share each other. Enjoy to read reviews about Technology, Movies, Games, Final Fantasy and many. What are you waiting for? Become our part of Selina's Wing Facebook page! Enjoy ya!